The orchestra themselves asked that Barbirolli should record the symphony with them, the first English conductor to record with the Berlin Philharmonic since Beecham in 1937. During the cold January of 1964 this famous recording was made in the Jesus-Christuskirche, in the suburb of Dahlem' - from Barbirolli, the Authorised Biography by Michael Kennedy. Sir John Barbirolli's Mahler Nine is currently available in the EMI Great Recordings of the Century Series, and for once the record company hype is more than justified. That Berlin critic really said it all - such human warmth and soul combined with superb musicianship. Barbirolli's account ranks alongside Bruno Maderna's as one of the the greatest performances of the symphony committed to record, and easily overshadows Herbert von Karajan's two later versions with the Berlin orchestra. It is forgotten today that Karajan's classic EMI recording of Die Meistersinger von Nürnberg, made in East Germany with the Staatskapelle Dresden, was originally planned for Barbirolli. But in 1968 Rafael Kubelik asked fellow musicians not to conduct in countries which supported the Russian invasion of Czechoslovakia. Barbirolli withdrew from the proposed recording, leaving the door open to the opportunist Karajan. The ghastly sleeve design in the header image is my original 1989 CD copy. Ominously the sound was digitally 're-engineered' in 2002. I haven't heard the result, but I cannot see how the original CD mastering could be improved on, or indeed why it needed 're-engineering'. The recording in Jesus-Christuskirche, Berlin was produced by Ronald Kinloch Anderson, and the sound engineer was Ernst Rothe from the local German EMI company. Glorious sound on my copy, glorious playing, and a glorious interpretation. Today, Mahler recordings are just another box to be ticked as conductors progress towards superstardom. It was very different in 1964. And there is not much human warmth and soul in EMI these days as new private equity owner Guy Hands prepares to cut up to a third of EMI's 5500 staff. Much has been made in the press of the concerns of EMI's rock artists, but there has been no mention of the priceless classical back-catalogue that is now in the hands of the asset strippers. Snap up Barbirolli's Mahler while you can, and also the new release of Thomas Adès' Violin Concerto before somebody gets their Hands on it. Too many dead Europeans? Try Glorious John in New York. Thanks for alerting me to the Maderna recording. I ordered it from Amazon right after reading your article. I subscribe to the notion that one can never have too many Mahler Ninths, so I can't wait to hear his interpretation. I agree about the Barbirolli too. 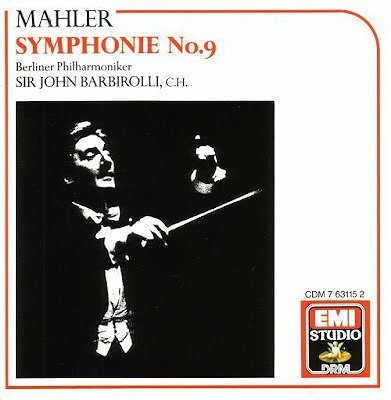 His recording (on EMI's GROC label - sounds great to me, but I can't compare it with the original CD pressing to see if the sound has been afffected by the remastering) was the first Mahler 9that I heard, and despite having about a dozen now, I still always come back to Barbirolli as my favorite. (His Mahler Fifth and Sixth are also very high on my list of performances of that symphony - especially the 1967 Sixth with the New Philharmonia Orchestra). Glad you mention this recording. The third appearance of that "weak heart" motif (ie the first thing you hear in the symphony; it's followed by a vaguely Chinese sequence of 4 notes), in the latter part of the 1st movement, is just about the most shattering sound on record. David, thanks for that. Interesting that heart conditions afflicted both by Mahler and Barbirolli. In 1963, the year before Mahler 9 was recorded, Barbirolli was diagnosed as suffering from arterio-sclerosis, with sclerosis of the artoric valve of the heart. He died of a major heart attack on July 20, 1970 after rehearsing Britten's Sinfonia da Requiem and Beethoven's Eroica. Mahler and Barbirolli were also both Roman Catholics. Barbirolli by choice, Mahler by convenience to qualify him for his appointment at the Vienna Court Opera in 1897.